Kmart has come out with a new pharmacy loyalty program to replace their former gas discount program. 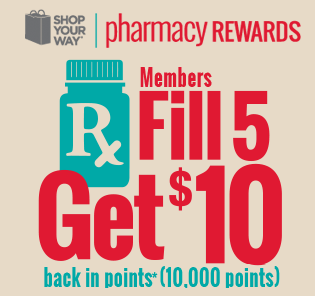 For the (5) prescriptions filled at the Pharmacy, members will get 10,000 points, or the equivalent to $10. Members can use their points to shop for qualifying purchases at any Kmart or Sears store or online and points are valid for (2) weeks once received. This deal even counts for pet’s prescriptions, so don’t miss out on this great way to save!